How does mobile phase organic solvent choice impact reversed-phase flash column chromatography? Organic and medicinal chemists frequently utilize flash chromatography to purify their reaction mixtures. Normal-phase flash chromatography is most often used but may not the best methodology, especially when the compounds are quite polar and/or ionizable. For these molecules, reversed-phase flash chromatography is preferred but often is not used due to an uncertainty regarding the best solvent choices and the reversed-phase mechanism. In this post, I will discuss how organic solvent choice in reversed-phase chromatography can influence the chromatographic separation. Reversed-phase vs. normal-phase – how do you determine which mode to use? In a previous post, I have addressed this topic but the basic rule-of-thumb is if the sample is soluble in polar solvents (methanol, acetonitrile, water, or is ionic), then use reversed-phase. Think about your workflow process – synthesize, analyze by HPLC-MS (typically reversed-phase), purify target compound with flash chromatography (usually normal-phase), evaporate the solvent, dissolve the target compound in reaction solvent, perform the next reaction. Though many chemists will also scout their reaction progress using normal-phase TLC, increasingly chemists are relying on HPLC-MS to ensure they have synthesized their molecule and to see what the impurity profile looks like. Many of these LC-MS methods are classified as polar, non-polar, or generic based on the synthesized compound’s functionality and/or solubility. If a “polar” analysis method is used (say a 5% to 50% methanol or acetonitrile gradient), then a reversed-phase method should be considered for the flash purification step. But that begs the question – methanol and acetonitrile, how are they chromatographically different and when should I choose one over the other? Acetonitrile is more UV transparent at low wavelengths so is better when detecting compounds at wavelengths under 220 nm. Other solvent differences, however, may make-or-break the separation and flash purification. Those differences are polarity and selectivity. Just as with normal-phase, solvents fall into different polarity and selectivity classes. In the case of methanol, it is a polar alcohol in selectivity class 2; for acetonitrile, it is less polar than methanol and is a selectivity class 6 solvent. What this means is that there will be instances where the organic solvent choice impacts the separation of two or more compounds in a sample both in retention and separation performance. I recently was conducting some purifications of Equal® (my preferred source of aspartame sample) and caffeine. 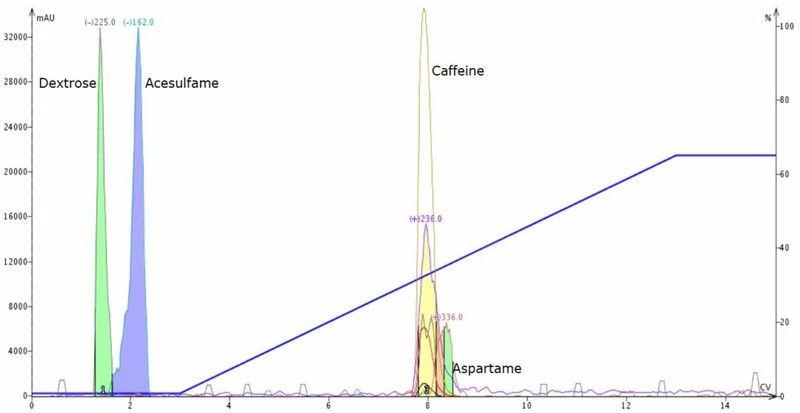 My initial data showed that caffeine and aspartame virtually co-eluted with the gradient I used (0-65% acetonitrile in water), Figure 1. Figure 1. 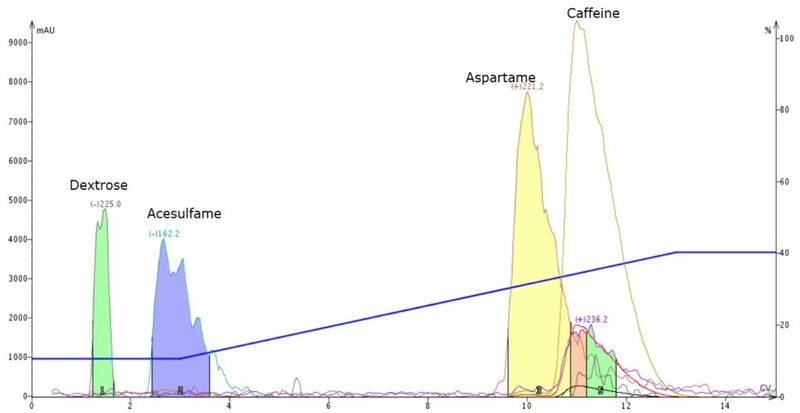 Initial separation of Equal + caffeine using a 0-65% acetonitrile gradient provided minimal separation of caffeine and aspartame. To get these compounds to separate I made my gradient shallower (a typical first choice to optimize my separations) but noticed only marginal improvement, Figure 2. Figure 2. 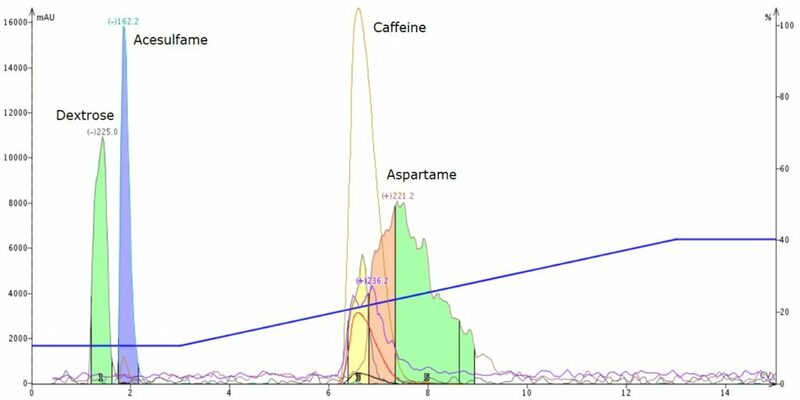 Reducing the gradient slope from 0-65% acetonitrile to 10-40% acetonitrile slightly improved the separation of caffeine and aspartame. So, in an attempt to further improve the separation, I replaced acetonitrile with methanol and noticed a change in elution order – aspartame now eluted before caffeine, Figure 3. Figure 3. Separation of caffeine-spiked Equal using a water-methanol gradient shows a change in the caffeine-aspartame elution order, greatly improving their separation. As an added bonus, dextrose and acesulfame are also better resolved. So, what have I learned? Well, it has taught me that organic solvent choice is as important in reversed-phase as it is in normal-phase so when developing a reversed-phase purification method, evaluate both methanol and acetonitrile on your HPLC to see which performs the separation better. Then use that method for your flash chromatography. For more information on solvent strength and selectivity classes I recommend Snyder and Kirkland’s Introduction to Modern Liquid Chromatography or the information included at sanderkok.com. Thanks for the data Bob. We originally were using MeOH/water exclusively with our analytical LC-MS (and reverse phase Biotage) since it is cheaper than CH3CN, but it seems that we have had far fewer clogs when we switched to CH3CN. This may be a factor of our specific compounds, but we make a wide range of molecules. I do however recommend investigating both MeOH and CH3CN as you suggested for difficult separations. We have occasionally also seen mixtures that have significantly better resolution with one or the other solvent. Thanks for sharing your experience with lower compound solubility in methanol-based reversed-phase chromatography. Personally, I have not encountered this phenomena though I have seen the opposite (MeOH soluble / MeCN insoluble). All the more reason to investigate chromatography with several organic solvents as you recommend. Just a few thoughts. When it comes to choosing between normal and reverse phase I tend to favour normal phase because it’s easier to evaporate the fractions. However on occasion reverse phase is the more convenient if it means no work up. Making amides is very common. I use HATU as reagent and do the reactions in a small amount of DMF then when complete the whole reaction is injected onto my reverse phase flash column. A gradient starting with 85% water will wash off the polar reaction by products then later comes the amide. It’s very quick to purify several reactions and the product fractions go on the freeze drier overnight. The problem with methanol for reverse phase is that all our open access LC/MS systems use CH3CN so it’s difficult to know if MeOH would give a better result. I would have to take a chance and hope to get lucky. We really need a simple hplc machine set up for side by side comparisons. Previous Previous post: Why do I see more peaks than I expect with flash column chromatography? Next Next post: When should I add acid to my detector make-up solvent when using mass-directed flash chromatography?